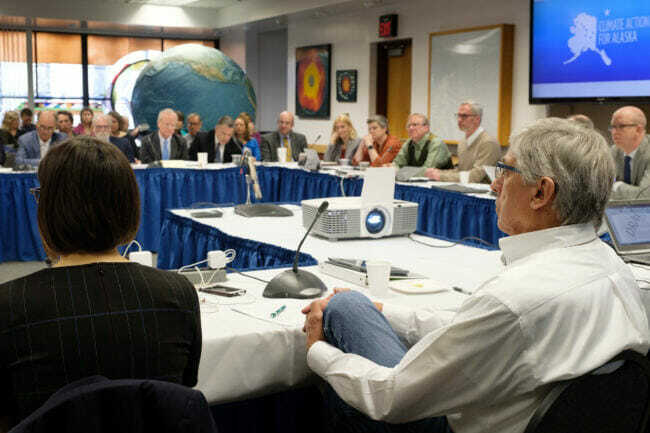 Meeting of Governor Walker’s Climate Action Leadership team, chaired by Lieutenant Governor Byron Mallott, on the University of Alaska Fairbanks Campus, in Fairbanks, Alaska, April 12, 2018. Be bold. That was the message in Fairbanks on Thursday, as Governor Bill Walker’s climate change task force met to begin hammering out specific recommendations for how the state should react to a warming world. It was the second time that the full group met in person since they were formed last fall. The meeting came a day after their first public listening session, which was also held in Fairbanks. Luke Hopkins, former Mayor of the Fairbanks North Star Borough, led that session, and he said there was one clear takeaway. “Alaskans want to see us be bold in our statement,” Hopkins said. Hopkins said the public comments offered a wide range of suggestions for what boldness might look like, from greenhouse gas reduction to carbon pricing to an aggressive push for adaptation. Task force members clearly took that sentiment to heart. The word “bold” came up repeatedly at the meeting. Many members said it was something they wanted to see reflected in the policy recommendations they make to the governor in September. But President Jim Johnsen of the University of Alaska said that while he believes in the urgency of the issues at hand, it’s not the language he would choose. There was broad recognition that the draft is not final, and a lot of refining lies ahead. Some members said they hoped that the final product will have more decisive language and specificity — like the rate by which emissions should be reduced by 2030. “We’re seeing a transformation of a relatively general statement into a more specific statement that includes actions and objectives that can be met in the near term, but also a vision for where we need to be going in the future,” Chris Rose, Executive Director of the Renewable Energy Alaska Project, said. Sam Schimmel is a high school senior from the Kenai Peninsula and St. Lawrence Island. He said he’d like to add more recognition that even though climate change is a “slow-moving disaster,” it’s affecting people in Alaska today. He said his uncles, who are whalers, are just one example. Linda Behnken, Executive Director of the Alaska Longline Fishermen’s Association, says she’d like the group to consider adding a carbon offset or sequestration recommendation to the policy. That system allows big polluters in places where there are limits on carbon emissions to go over that limit by purchasing carbon credits from other places — essentially, paying them to keep their carbon in the ground — whether it’s in the form of timber, coal or other resources. Janet Weiss, President of BP Alaska, is the sole representative of the oil industry on the task force. She said the industry has its part to do in bringing down carbon emissions by making their operations as efficient as possible. Weiss also said that the task force should be mindful of the impact that some of their recommendations could have on the economy. Between now and September, the team will be working toward nailing down more specifics. Nils Andreassen is executive director of Institute of the North and coordinator for the task force. He says the policy draft discussed at the meeting is meant to be a guiding document. It will be complemented by a more granular action plan, a draft of which will likely be released this summer. Going forward, the group will be bringing on a science advisory panel and an oil and gas technical committee to help give them the information they’d need to get more detailed in their recommendations — like setting carbon emission reduction targets. Andreassen says that the task force plans to hold more public hearings around the state as they draft these documents. The public can also submit comments online.